Rupert Campbell is fascinated by the witches who live nearby. He dreams of broomstick tours and souvenir potions, but Rupert’s mother forbids him from even looking at that part of town. 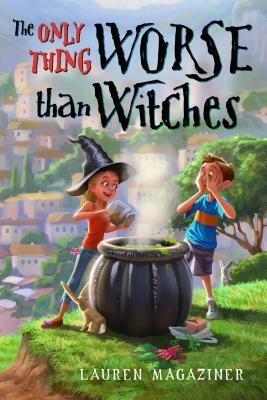 The closest he can get to a witchy experience is sitting in class with his awful teacher Mrs. Frabbleknacker, who smells like bellybutton lint and forbids Rupert’s classmates from talking to each other before, during, and after class. So when he sees an ad to become a witch’s apprentice, Rupert simply can’t resist applying. But Witchling Two isn’t exactly what Rupert expected. With a hankering for lollipops and the magical aptitude of a toad, she needs all the help she can get to pass her exams and become a full-fledged witch. She’s determined to help Rupert stand up to dreadful Mrs. Frabbleknacker too, but the witchling's magic will be as useful as a clump of seaweed unless Rupert can figure out a way to help her improve her spellcasting—and fast! Lauren Magaziner recently graduated from Hamilton College. She lives in Brooklyn, New York. The Only Thing Worse Than Witches is her first book.